BAD KLEINKIRCHHEIM, Austria — The first women's World Cup speed races in 2018 were doubtful on Friday as the snow on parts of the course was still too weak after heavy rain this week and mild temperatures. 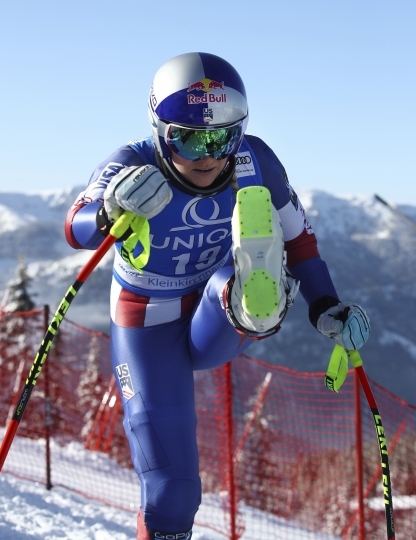 "It's a difficult situation right now with the way the snow is and how they prepared the course," Lindsey Vonn told The Associated Press. "I am not sure if we are going to be able to get a race off, but they are definitely trying as hard as they can." The American standout added "the top is good but the bottom is not safe to race." "Of course we all want to race but the conditions have to be good," Tina Weirather of Liechtenstein said. "I hope there will be a clear decision tomorrow morning, not postponing and waiting." As the skiers' representatives this weekend, Vonn and Weirather will be talking to the race jury on Saturday when decisions are made. "We have a strong voice," said Vonn, adding the races should not be staged at all costs with the Winter Olympics in Pyeongchang only a month away. Austria's Christina Ager posted the fastest time in the short training session, followed by Sofia Goggia of Italy and Weirather. American teammate Mikaela Shiffrin, who leads the season's downhill standings after two events, is sitting out this weekend's races to rest.